Chances are pretty good you have come in contact with interlocking carpet tiles and not even realized it before. Advances in design over the years have transformed this particular type flooring to the point that they can often be mistaken for regular carpeting. The interlocking carpet tiles offer many benefits, perfect for trade shows, office design, or as tumbling mats in a playroom. Perhaps you are looking for an affordable way to transform that boring and dated basement concrete floor, the carpet tiles are versatile, durable, fun, and affordable. This is the perfect weekend do-it-yourself project, and the carpet tile segments come in numerous colors and designs to match any decor. What are Interlocking Carpet Tiles? This type of flooring is exactly what the name implies. these carpet tiles are square pieces of carpeting that simply fit together perfectly to cover a range of floor spaces. 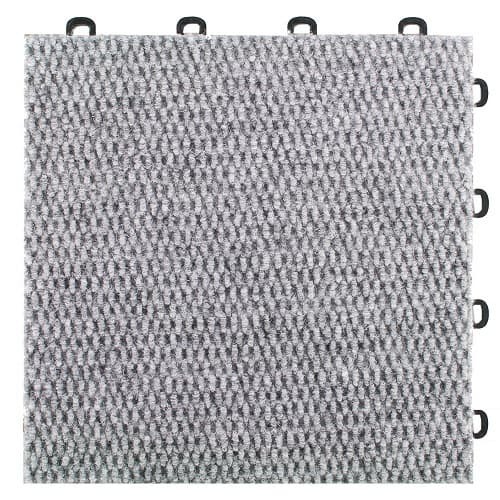 Also known as carpet squares or modular carpet, the tiles are usually 12″ x 12″, 18″ x 18″, or 24″ x 24″. 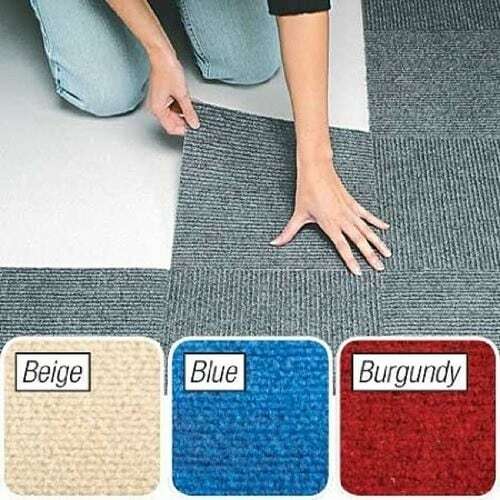 These interlocking carpet tiles are an affordable choice for the homeowner or business owner. The tiles are extremely lightweight, portable, and are a breeze to install. The economy grade can withstand heavy traffic at a trade show but will need to be replaced after 20 or more shows. The better grade carpet tiles will last longer and hold up to extreme abuse. 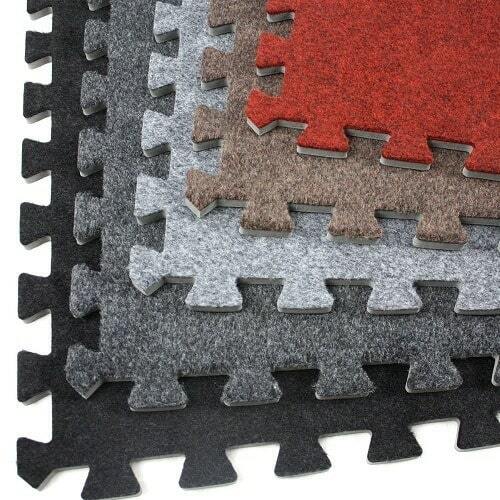 Carpet tiles have high-density EVA foam backing for providing cushion underfoot. 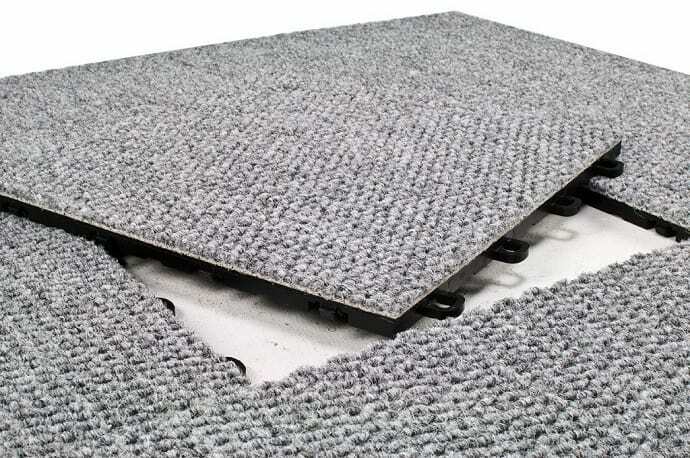 Interlocking carpet tiles are sound absorbing, waterproof, and help insulate users from cold concrete subfloors. These carpet tiles have been growing in popularity over the years, and today they can be found in offices, gyms, trade shows, conventions, playrooms, or even in schools as wrestling mats. It doesn’t matter if the carpeting tiles are being used as tumbling mats in a preschool or as wrestling mats at the high school, there are several color combinations available to match the surrounding decor perfectly. Tiles can also me mixed-and-matches to create stunning new design patterns that are fun and draw in the eye. The interlocking carpet tiles are an affordable alternative to any other type flooring. The fact you are putting the tiles down yourself means you are even saving on delivery charges and installation fees. They add warmth to any room and can be easily cut with a razor to fit perfectly in a corner. Maintaining the carpet tiles could not be any easier. If a section becomes damaged with a tear or stain, simply pop it out and replace with a new one in minutes and it will blend in perfectly with the surrounding tiles. 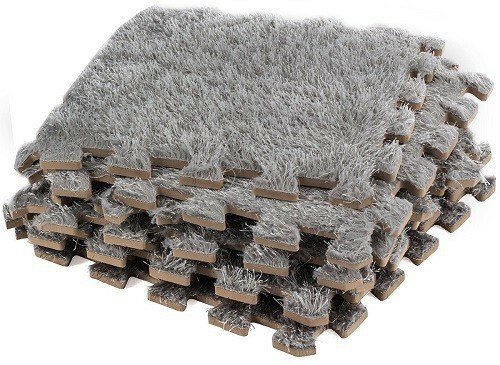 They can be vacuumed like traditional carpeting, and low pile means less dirt or debris will be trapped in the fibers. Even with heavy trade show traffic or abuse by kids at the school, these interlocking carpet tiles can withstand years of abuse. The tightly looped piles are ideal for heavy commercial traffic, holding up very well after a simple cleaning. These tiles can come with stain protection too, to extend the life of the materials. Due to the low pile and tight knitting, these tiles are water-resistant. Spills remain on the surface of the flooring longer, allowing you plenty of time to make a quick clean up before it reaches the padding below. Perhaps the biggest reason for the popularity of these carpet tiles is the simple installation process. 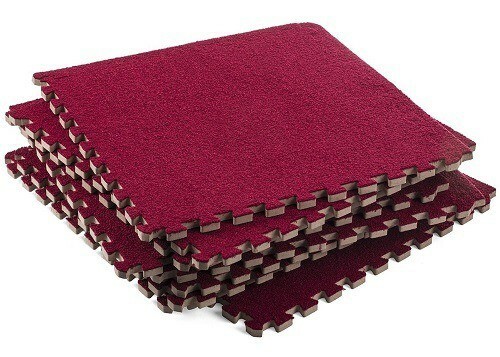 If you are using the carpet tiles as wrestling mats in the center of a room, you place the adhesive on the ground, attach the corner of one mat, then another, until all four mats meet the adhesive in the middle. If installing wall to wall, the same process except as you get close to the end of the room, you measure the remaining space and flip the tiles over to cut with a razor. The interlocking edges provide a tight seal between pieces and help to ensure a seamless appearance throughout. These carpet tiles are made of premium quality foam and have a soft texture that gives them an inviting appearance. Each piece of the carpeting tiles snugs together perfectly for that seamless look. Transform the look of a daycare center, child’s bedroom, or trade show area. Plush carpeting tiles give any room a luxurious and inviting look. The higher plush pile means it is harder to see the seams that connect the tiles together. Perfect for that entryway into the house or to give a child’s room a burst of style. These low pile carpeting tiles have a professional look that works well in any office building or trade show. They are able to snap together easily and can withstand heavy commercial traffic. The tiles are designed to last and clean up exceptionally well. Whether you are looking for wrestling mats, day care flooring, tumbling mates, or exercise mats, these foam carpet tiles are the answer. Interlocking pieces ensure they hold together tightly and come in a huge variety of colors. 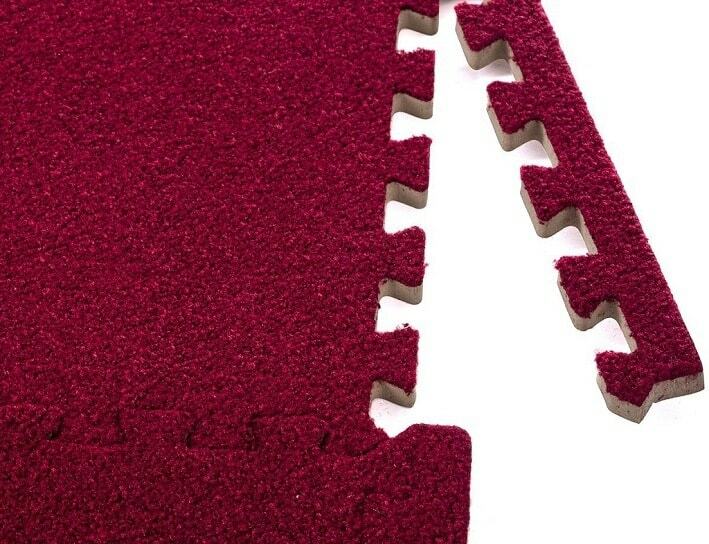 These peel and stick carpet tiles are designed to cover 10 square feet of indoor use. The tiles come in a variety of colors and will change the look of that location instantly. Easy to renovate a room in hours without any installation team required.